We're currently half way through our two week Easter holidays here. And I'm realising that now Izzy goes to school, there's a whole lot more entertaining that needs to go on in the holidays. This was especially obvious last Monday, the first day of our holidays, when I took the kids clothes shopping with me and my sisters. And ended up in A and E with Ethan. He got his hand caught in the bottom of the escalator. Yes. The grindy, stairs disappearing bit. I was at the top with Izzy, and Ethan was waiting at the bottom with my sister. He somehow managed to get out of her grip and tried to run up the escalator moving downwards. He fell over and put his hands down. That's when he got his hands caught. My sister grabbed him, but not before his hand started bleeding. Not a good moment for me. But by some miracle he was only had a minor injury on one finger. In fact, it's healed so well that he's had the bandage off a couple of days already. On a more funny note. I've now told my sister that her nephew can now legitimately give her the finger...just to show her his scar of course! So that's why the theme of today is kid-friendly activities! I think this bird house is such an awesome idea. It's from Gardeners.com, but is no longer available. I'm sure you could make and decorate your own with the kids. How great would it be to watch the bird's eggs and the adults coming in? I'd have to make sure ours was on a downstairs window or our kids would never fall asleep! This one is more "I'm cheap" than anything! 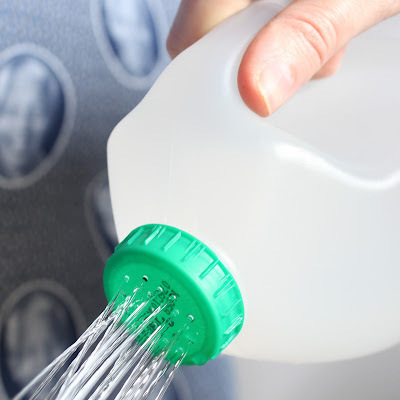 But last year our watering can got broken, so this is the perfect alternative for our kids. Plus they can each get their own! The tutorial is over at a journey to a dream. What an awesome, idea! I've got a couple of rolls saved up already, this one may be on our list for today! And I'm sure I could add some pom poms or cotton wool to the mix to make it appeal even more to my craft loving daughter! See the how to at Toys in the Dryer. 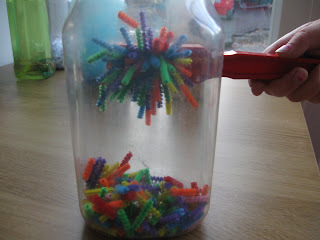 This post has loads of different activities in a bottle ideas. This is my favourite! Making them with your kids would be as much fun as playing with them too! The full post is over at Pre-school Play. What have you got planned this holiday? Any other ideas that don't involve places with escalators? Ouch! I'm still cringing, thinking about that escalator story. Holidays are tons of fun for, and also hard on kids :(.